Provides full wireless keyboard and air mouse support plus basic remote control functions to Andorid-powered smartphones, tablets and media centres in addition to desktop PCs, Laptops and other media players which run Windows XP/Vista/7/8, Mac OS or Linux systems. If you have a Media PC, or Android TV, you simply MUST have this remote! This little 3-in-1 gadget is absolutely brilliant, and it has impressed everyone in the Cable Chick office. It's bascially a Wii remote for your PC, Laptop, Tablet or Andorid Media Player, giving you a 2.4G Wireless Keyboard and Air Mouse functions. What is an Air Mouse? That's a mouse that doesn't need a desk! Just wave your magic wand in the general direction of the USB receiver dongle and the cursor on-screen will wiggle about to match your movements! Left and right clicking is supported, so complete Windows-Based actions are possible. Accuracy is good, but you'll feel like you're playing Surgeon Simulator at first because of the floaty feeling of using the mouse in the air. Flip the remote over, and you have a full QWERTY keyboard with arrow keys and a home button which will take you back to those days when mobile phones were huge and had rubber bits you pressed. You won't be writing an essay with it, but for YouTube searches and quick tweets, it's very handy! Great for offices, conference rooms, classrooms, pubs, clubs, and of course your home PC, Laptop or compatible Tablet. Plug and Play - No Driver Disc! Full air mouse support - no desk surface required! Note: Not all remote control features will be available on all operating systems or inside of all apps. Full Keyboard and Mouse support provided for all compatible applications. Right-click function applicable to Windows Desktop OS only. Answer: "Unfortunately the receiver dongles are not sold separately. This Air Mouse is not compatible with TVs, PS4 or XB1 consoles - only Windows, Mac, Linux and Android OS systems." 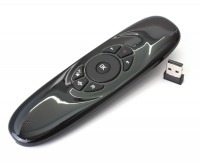 Answer: "The easiest way to find out if this device works with any make or model of TV is to attach a regular USB computer mouse first - if that works correctly, then this wireless mouse will also work. Many TV's don't use Windows, OSX, Linux or Android to operate, and many more can only read files from USB storage devices like USB sticks (and they won't look at peripherals like mice and keyboards). The best bet is to check your TV's user guide to find out what features are available for Smart TV control (but the above test will also give a quick answer)." Answer: "This device features a 6 axis gyroscope." Just wanted to thank you for the excellent service offered by Cable Chick. I have placed 4 separate orders this month and every delivery has arrived in Melbourne the next day. Exceptional standards. Keep up the good work.